The fourth and final trade of The Astounding Wolf-Man which collects issues 19 through 25 of the series has finally hit shelves after months of me waiting impatiently for it. I’m really disappointed that this book has ended, Robert Kirkman and Jason Howard have done an astounding (pun intended) job on this book and twenty-five issues just isn’t enough for me. I partially blame myself for this book ending because I only read it in trades, but I can’t change the past… yet. At this point Wolf-Man has escaped prison with The Face, Mecha-Maid, and a couple other criminals in hopes of learning what The Face is up to. The group has ended up at Stone Henge because it turns out that the monument is actually a monster that’s been imprisoned there for hundreds of years and has promised The Face to be his ultimate weapon if he frees him. So the monster is freed and the first thing it does is pick up The Face and eat him. The monster then heads for Manhattan to start some Godzilla style trouble. So Mecha-Maid turns into a jet pack and gets Wolf-Man after the monster to save everyone, and once the monster is destroyed the public decides he is a hero and he ends up on the talk show circuit to clear his name about the whole, “Hey a vampire killed my wife and framed me for the murder” thing. 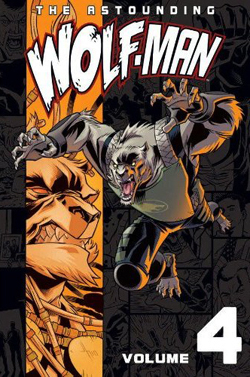 So now Wolf-Man is working with Cecil Stedman (who we know from Invincible) with his daughter (now going by Vampire Girl) as a superhero. Things are now going pretty well for Gary, he’s got his home and his money back, his super hero lair, his name has been cleared, and he’s got his daughter back. The rest of the book is used to finish up all the loose ends. Remember that guy with the energy absorbing powers from issue 5 who tried to kill a scientist and Wolf-Man caught him and sent him to prison? Well he shows up again and this time Wolf-Man is able to turn him into an ally and bring him in to work for the U.S. government. But we still have to finish up with Zechariah, and the Elder Wolf who turned Gary into a werewolf in the first place. Now Zechariah is in custody, but the Actioneers are still vampires and Gary would much rather have him dead. So Mecha-Maid breaks Zechariah out of his holding cell to trick him into thinking she’s on his side. Unfortunately when Wolf-Man comes in to kill the vampire it doesn’t go according to plan and he once again escapes. Then that same night an army of werewolves shows up at Gary’s house and after a lengthy battle that ends up killing Gary’s best friend we’re almost back to square one. If things weren’t bad enough Zechariah shows up in the middle of the night and kidnaps Gary’s daughter, Gary changes into Wolf-Man and chases after them, but he’s stopped by the Elder Wolf who has come to challenge Wolf-Man. Wolf-Man tries to break away, but the Elder won’t yield, eventually the Wolf agrees to postpone the fight for twenty-four hours so Gary can rescue his daughter. Eventually Wolf-Man tracks down Zechariah and we’re finally going to get the final showdown between these two. Except we’re not because The Elder Wolf shows up again and rips the vampire’s heart out of his chest and eats it. So instead we get the final showdown between Wolf-Man and The Elder Wolf. The Elder Wolf explains that he’s been a terrible ruler of the werewolves for hundreds of years and after spending several years watching Gary he decided that Gary would be a much better suited ruler of the werewolves, but Gary can’t take over unless he kills The Elder Wolf in battle. The battle is pretty ruthless, but eventually Wolf-Man is able to rip the Elder’s throat apart leaving Gary as the new Elder Wolf. The book ends with Gary inviting all the wolf-people to live in his estate, and he creates a whole team of wolf-powered super heroes. And if you were wondering about the Actioneers, they became human again after Zechariah was killed. I’m kind of torn on this last book, there things I liked, but overall I think it felt rushed. I’m happy that Kirkman was able to wrap all the loose ends and Gary got his life back, but I think it needed a few more issues to set things right. I thought it was kind of dumb for them to break Zechariah out of prison just to get revenge, it seems irresponsible, but at the same time I get bringing him back out at the same time Gary’s being attacked by The Elder Wolf brings in more suspense, but then it’s the Elder Wolf that ends up killing him instead of Wolf-Man. My complaints aside there was a lot of cool stuff in the book, I especially love all the side characters. I really liked the side storyline with Mecha-Maid’s virtual daughter wanting her own body, and then when Donald steps in and claims keeping the daughter in the same body as Mecha-Maid is almost a form of child abuse. And I love how the “Wolf-Car” turns into robot armor, awesome. I really did like this series and I’m sad to see it end, but at the same time I’m incredibly excited for Kirkman’s and Howard’s next book, Super Dinosaur, look for it in April, but until then you can get this book and the other three volumes at Amazon.